The DL850 G3 Power Measurement option can be used to calculate the power of a Sinusoid-Current Burst. Please download and view image for a screenshot demonstration of the DL850 G3 Power Function. The firmware version of the DL850 when the screenshot was taken was version 1.35. The G3 Power Function was used to measure six cycles of a 100Hz, 10Apeak current burst from a static 10Vpeak voltage supply. 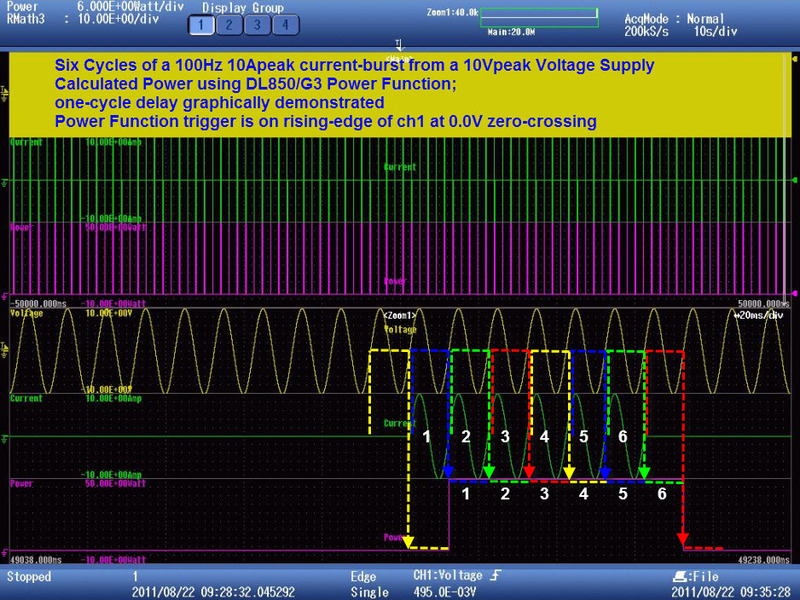 The trigger was set to trigger on the rising edge of CH12 at the 0.0V zero-crossing. The DL850 G3 Power Function was used to calculate power (Watts) on a cycle-by-cycle basis with a one-cycle delay.